Today I welcome back TLC Book Tours to the blog with a mystery. I invite you to read my review and visit the other stops on the book tour. I had mixed feelings as I was reading this book and even after I closed the last page I was torn about what to write in my review. 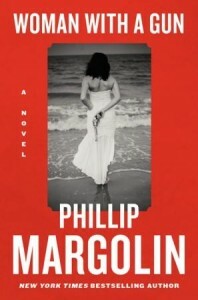 The plot is a unique idea and involves a photograph, a novelist and a murder mystery. Stacey Kim moves from the Midwest to New York City after she earns her MFA in the hopes of becoming a famous novelist. When she sees a photo entitled “Woman with a Gun” at a local art show, she becomes inspired to write a fictionalized story about the woman in the photo that is holding the gun. The story jumps back and forth between Stacey’s investigation of the photo and an earlier time period during which the photo was taken. The photo was captured by the artist, Kathy Moran, when she encountered Megan Cahill, dressed in white and holding an antique gun, on the beach. Megan’s husband has just been murdered and, of course, she is the prime suspect. I found some aspects of the investigation fairly typical for a mystery novel. There is the suspicious wife, who stands to inherit a lot of money when her husband dies, the jaded detective with the dysfunctional personal life, and the eager writer who just happens to crack the case wide open. I found it difficult to become invested in the characters. I really wanted to like Stacey and see her succeed but her character is never fully developed outside of her desire to become a novelist. I also found the writing and dialogue to be very terse and this did not help the slow pacing of the book. But if you enjoy a murder mystery then give WOMAN WITH A GUN a try and visit the additional blogs on the tour to see what other reviewers are saying about the book. 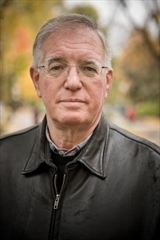 Phillip Margolin has written eighteen novels, many of them New York Times bestsellers, including the recent Worthy Brown’s Daughter, Sleight of Hand, and the Washington Trilogy. Each displays a unique, compelling insider’s view of criminal behavior, which comes from his long background as a criminal defense attorney who has handled thirty murder cases. Winner of the Distinguished Northwest Writer Award, he lives in Portland, Oregon. Click on the TLC Book Tour logo below to visit all of the stops on the tour. Thanks for sharing your thoughts on this book for the tour. My day job is teaching Latin and Ancient Greek at an independent day and boarding school in New England. I enjoy books in various genres, but especially literary fiction, literature in translation, historical fiction, history, short stories and travel writing and poetry. Background artwork "Come Back Winter" by Sunandini Banerjee. Used with permission from the artist.